Product prices and availability are accurate as of 2019-04-16 07:39:36 UTC and are subject to change. Any price and availability information displayed on http://www.amazon.com/ at the time of purchase will apply to the purchase of this product. Both the wires are pure copper to ensure the best conductivity and power transfer possible. 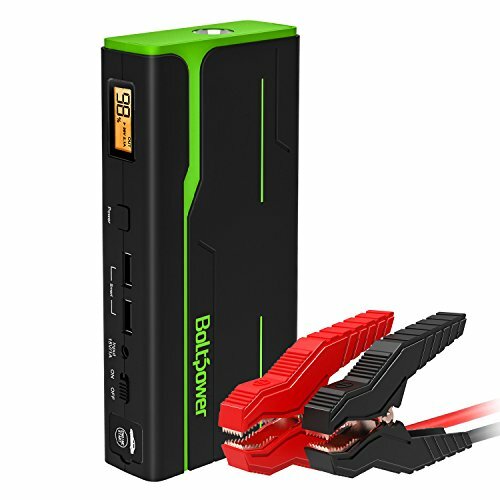 Portable jump starter that can jump multiple vehicles on a single charge. 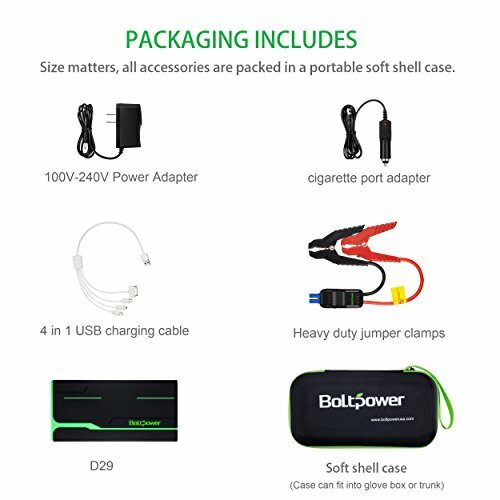 18,000mAh dual USB power bank is capable to fully charge most smartphones, tablets, phablets, bluetooth speaker, activity tracker, smart watches and other 5-volt USB devices. 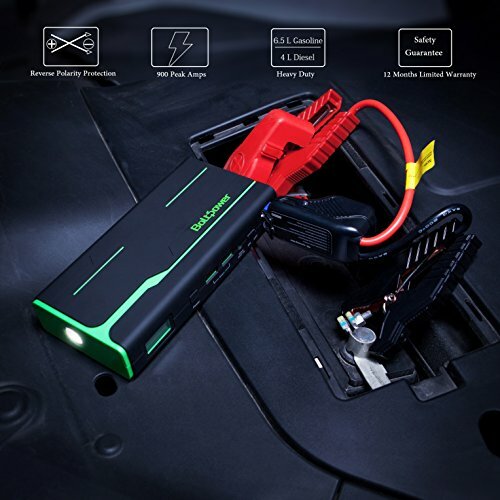 Unlike traditional bulky jump starter packs, it's small enough to store in your glovebox and light enough to pack in your bag. It may not be able to start your engine If the unit is below 25% battery life. Do not connect the positive and negative polarity together when the unit is powered. Please disconnect the jumper clamps within 10 seconds after successfully jump start the vehicle. Gasoline engine up to 6.5 Liter. Diesel engine up to 4 Liter. Bolt Power D29 lithium portable jump starter rated at 900 Amps is capable to jump start Cars, Boats, Trucks, Tractors, RV, SUV, Motorcycles, Lawnmowers and more. 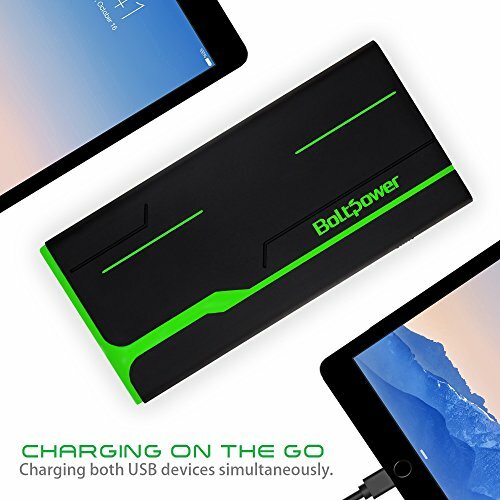 Built-in 18,000mAh battery pack with dual USB port provides 2 times faster charge to mobile phones, tablets and other 5V USB devices at speeds up to 2.1 amps per port. 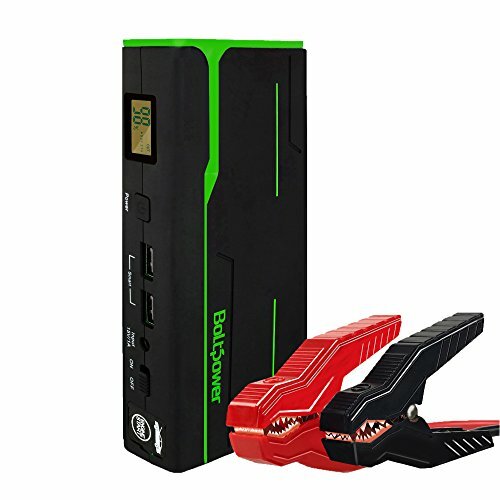 Ultra Bright Flashlight: Built in flashlight has three modes (solid beam, strobe & SOS) Digital Display: Monitors charge level of internal battery and USB output amperage. Upgraded heavy duty jumper clamps has built-in circuit protection; it is perfect for vehicle jump starting in all weather conditions.